I thought I’d be hiking to Chapel Rock, like every day, but one of my favorite things have been just going across the street to Lake Superior. Literally across the street. I could look for rocks all day long. They are works of art in themselves. Here are some notes from my Artist In Residence (AIR). I hope it’s both entertaining and educational for future artists who are hoping to get into this amazing adventure. The van was loaded to the max (see pics). So many other things I wanted to bring but just didn’t have the room. There were so many antique shops I wanted to stop at but had a schedule to keep as the Park Ranger was going to let me into the cabin and give me the lowdown… I’m sure close to the end of their day. Ron showed me around the cabin, signed the NPS Volunteer forms and paperwork, and headed across the street to check out the Lake. Sullivan’s Cabin is situated right next to Sullivan’s Creek and across from the Lake Superior Overlook. Great view and a fine beach with the meandering creek output right there. Soooooo many interesting rocks, pebbles, etc. to check out. One thing to keep in mind is distance… it doesn’t look far, but places take a while to get to from the cabin, due to the curvy, narrow roads, deer… and it’s dark! No cell phone coverage in many places to make sure you have extra LED lights, etc., if there are any issues. I was invited to the Bear Trap for dinner with the volunteers who were finishing up for the month. Great to get tips from the volunteers and a great group of folks. When I got back, I got right to organizing the studio by moving the furniture out of the way and putting up my tables. The cabin is powered by solar, so I was advised to be conservative with the power usage. The water pump is also solar powered. The pump is loud, but I got used to it. The national lakeshore provides a three-week park residence, just a stone’s throw from the shore of Lake Superior. 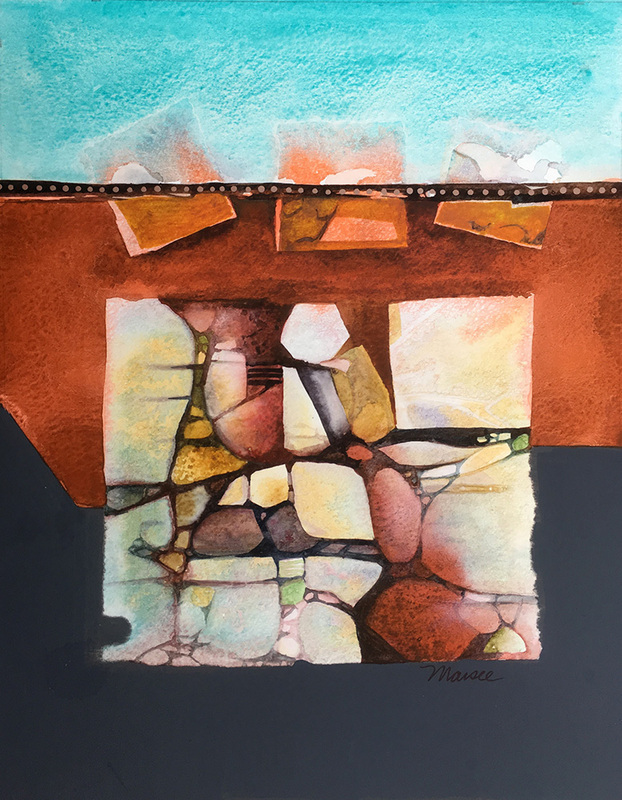 Todd will be immersing himself in the beauty of the Upper Peninsula’s colors and textures, and pour his experiences into his paintings. He is also planning on participating in some group hikes, kayaking, and viewing the brilliantly colored cliffs, sea caves, and beaches from a boat cruise. As the Artist in Residence, Todd will host an outdoor painting demonstration at the Miners Castle Information Station on Saturday, September 30. Miners Castle is a photogenic rock formation and one of the park’s most popular destinations. He will also donate a painting to the park’s collection.